367 pages | 120 B/W Illus. For decades biology has focused on decoding cellular processes one gene at a time, but many of the most pressing biological questions, as well as diseases such as cancer and heart disease, are related to complex systems involving the interaction of hundreds, or even thousands, of gene products and other factors. How do we begin to understand this complexity? Fundamentals of Systems Biology: From Synthetic Circuits to Whole-cell Models introduces students to methods they can use to tackle complex systems head-on, carefully walking them through studies that comprise the foundation and frontier of systems biology. 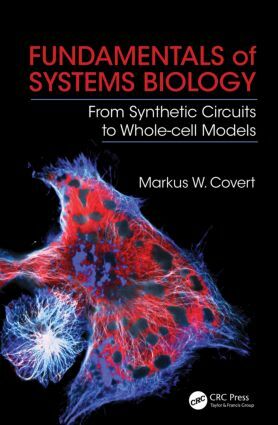 The first section of the book focuses on bringing students quickly up to speed with a variety of modeling methods in the context of a synthetic biological circuit. This innovative approach builds intuition about the strengths and weaknesses of each method and becomes critical in the book’s second half, where much more complicated network models are addressed—including transcriptional, signaling, metabolic, and even integrated multi-network models. The approach makes the work much more accessible to novices (undergraduates, medical students, and biologists new to mathematical modeling) while still having much to offer experienced modelers--whether their interests are microbes, organs, whole organisms, diseases, synthetic biology, or just about any field that investigates living systems. "Author has excellent command of both aspects of systems biology." "… an excellent introduction to systems thinking and modeling in the context of complex biological problems. … uses concrete biological examples to develop systems concepts and model step by step, thus enabling the reader to understand the power of systems biology in the study of complex biological phenomena. … develops a deep intuition of systems thinking in the context of complex biological phenomena. This intuition is then translated into concrete systems modeling approaches enabling readers to apply the systems approach to their own problems."